Today, the Missouri State Quarter Coin remembers the long, drawn out New Madrid earthquake of 1811-1812. Some claim the strongest tremors occurred on February 7, 1812. Dr. Berry, of Southern Illinois, many years ago, collected from the oldest settlers reminiscences of the New Madrid earthquake period. He gave these reminiscences to the Illinois Historical Society. One of the stories he told was of the experience of a family which had a plantation bell mounted on a post, after a custom of the period. This bell rang whenever there was an earthquake tremor. The family took warning and ran from the house when the bell rang. The settler who gave his recollections as a boy to Dr. Berry said that during the period from December 15th to the middle of March, including the New Madrid earthquake, the bell rang almost every day. Some days it rang continuously for hours. The old settler said he was aroused so often at night by the ringing of the bell that he became as “spry as a cat” in jumping from his bed and out of the window. The scientists of Johns Hopkins University years ago carried on a series of experiments in the Mississippi Valley below St. Louis and determined that occasional little tremors originated in the vicinity of New Madrid and radiated outward from 100 to 300 miles. Colonel John Shaw of Marquette county, Wisconsin, was visiting near New Madrid the winter of the earthquake. He said that on February 7, 1812, he felt the most severe shock. “This was the first high ground above New Madrid, and here the fugitives formed an encampment. It was proposed that all should kneel and engage in supplicating God’s mercy, and all simultaneously. Catholics and Protestants, knelt and offered solemn prayer to their Creator. “About twelve miles back toward New Madrid a young woman about seventeen years of age, named Betsy Masters, had been left by her parents and family, her right leg having been broken below the knee by the falling of one of the weight poles of the roof of the cabin, and, though a total stranger, I was the only person who would consent to return and see whether she still survived. “Receiving a description of the locality of the place, I started and found the poor girl upon a bed as she had been left, with some water and cornbread within her reach. I cooked up some food for her and made her condition as comfortable as circumstances would allow and returned the same day to the grand encampment. Miss Masters eventually recovered. “In abandoning their homes on this emergency, the people stopped only long enough to get their teams and hurry in their families and some provisions. It was a matter of doubt among them whether water or fire would be most likely to burst forth and cover all the country. “The timber land around New Madrid sunk five or six feet, so that the lakes and lagoons, which seemed to have their beds pushed up, discharged their waters over the sunken lands. “Through the fissures caused by the earthquake were forced up vast quantities of a hard, jet-black substance which appeared very smooth, as if worn by friction. It seemed a very different substance from either anthracite or bituminous coal. “This hegira, with all its attendant, appalling circumstances, was a most heartrending scene and had the effect to constrain the most wicked and profane earnestly to plead to God in prayer for mercy. “The convulsion occurred contemporaneously with one of the most fatal earthquakes of South America, when the towns of Guayra and Caracas were laid in ruins. “Humboldt, the great geographer, has remarked that the shocks of New Madrid are the only examples on record of the ground having quaked almost incessantly for three months at a point so far remote from any active volcano. “The shocks were most violent in the part of the region called the Little Prairie, to the northward, as far as the mouth of the Ohio river. Some shocks were felt in South Carolina. “Although the country was thinly settled and most of the houses built of logs, the loss of life was considerable. “L. Bringier, an engineer of Louisiana, was on horseback near New Madrid in 1811 when some of the severest shocks were experienced. “As the waves advanced he saw the trees bend down and often the instant afterward, when in the act of recovering their position, meet the boughs of other trees similarly inclined so as to become interlocked, being prevented from righting themselves again. “The transit of the waves through the woods was marked by the crashing noise of countless branches first heard on one side and then on the other. 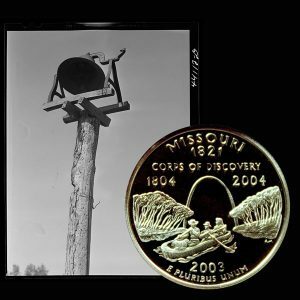 The Missouri State Quarter Coin shows with an image of a plantation bell, circa 1941.